Are your facial pores too big & its makes you feel conscious all the time? Do you sometimes feel like you're face is an oil-magnet? Do you just want to perk your face but you ran out of your favorite mask? ....then look no more. Open your fridge, take out an egg then crack it up to make one of the easiest face mask ever! This is the first facial mask that i ever tried. It was my aunt that introduced this & has been a fan ever since. I was a bit wary of putting egg thinking that it will smell disgusting or gross; but as long as you use fresh eggs, it won't bother you. Some people just use the Egg White, while some also use the Yolk. You can use it plain or you can even add something on it too. When im feeling lazy, i just use it plain, but often times i put a drop or two of lemon/lime on it. Lemon is a natural antiseptic so its good for pimples, its also good for the removal of blackheads & is used to whiten the skin. Feel free to add other ingredients which has good benefits like honey, milk, yogurt, papaya, avocado, etc...its just up to your imagination...This is why homemade facial mask is fun! Then put it on your face....wait until it dries...15 mins at the most. You'll feel that it tightens as it dries. It's completely dry if you can't twitch or smile anymore. Then rinse it out. Did you know that you can use this as a blackhead remover too? Dip the towelettes on the egg white then apply it on your face. Wait until it dries then remove it. It will take longer to dry, but its worth it. Much as i would like to take pic of how it removed my blackheads, i can't, because my cam is not up to it..lol..just take my word for it! You can use it as a pore strip. Not just on your nose but on your whole face as well! This is good especially for people who are having a hard time using a pore strip because of the shape of their nose...just like me... I have a button nose so its a bit hard for me to actually use a pore strip since there would always be some space underneath it...In this way, im able to 'mold' the towelette in any form i wanted so that it can follow the shape of my nose...yay! This saved me a couple of bucks since i don't need to buy pore strip anymore! double yay! In my case i use the Egg white since i have a super oily face...Egg Yolk as we know is considered to be the 'fatty' part (not the bad fat!) of the egg, therefore it is a natural moisturizer. 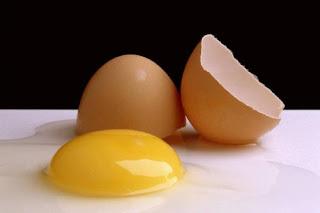 So for people who have super dry skin but would still like to give your face an instant face lift you can just use egg yolk. Egg white i think is more suitable for oily skin. Abby of Mia Picolli Piaceri even said that using the yolk as a mask will make the makeup adhere to the skin better therefore you won't need to use a primer...wow! sugoi! Make sure you try this one! omg you serious?! I'm sooooo trying this tonight!! I hate big pores! I love this idea especially using this with lemon, I have to try this. Plus it is cheap, I dont have to run out to the store to get anything. nothing beats homemade stuffs, but we're just too spoiled and lazy because of those ready made commercial products :) thanks for sharing and great day! Wow! Thanks for teaching, I want to try this out! We have alot of eggs lying around! Hahaha. reallyyy??? ive never heard about this before. Its frekain cool! will try soon. you have to. it really works! i'll be waiting for the pink look! I've never heard of using eggs as pore strips before - until now, that is. Maybe I'll try this out. :D Also, I nominated you for some awards! Hey sweetie thanks for the comment. When I checked coastal scents the first thing a saw was the 88 warm palette. I am so getting it hahah. Anyway Im gna try this homemade facial and pore strips since I have oily face and i need to take out a few black/white heads. Thanks! BTW pilipina ka pala! there's a lot of pinays in the blogger world. This looks wonderful for my oily skin! Thanks for sharing! What size are you? :) I can help you get shoes here, we have alot of bigger sizes! We can do a swap or something. I'll send it when my mom goes to the Philippines around the first week of August, so it will be cheaper shipping! Just suggesting. Teehee. WOW!! amazinggg i think i might try this out! anong towelettes gamit mo? yung wet towelettes? its a happy day today! ~rants & ramblings~ red lippie & safe cosmetics..